Honestly though, I don’t want to write anything for their wedding - ONLY because their photos came out as raw as a wedding day could get, representing exactly who they are and how many awesome people they’re surrounded by. Ashley and Matt met in 2011 while working at Apple store of Galleria, and the way Matt proposed to Ashley is beyond amazing. I literally screamed! They dance (or used to?) 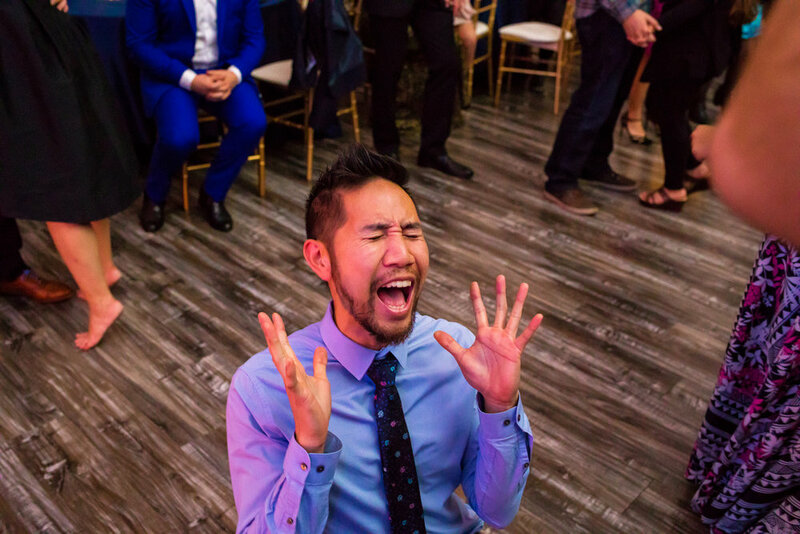 with a wild group of go-go dancers, called Random Acts of Irreverent Dance (aka RAID) and basically at midnight of Sept. 24, 2016, he threw a mashup show surprise proposal to Ashley in front of friends and many many screaming fans. I hope they don’t mind sharing the clip here. Matt is super talented working in film industry (also as an actor) and is only child while Ashley is the laidback yet more organized brain (than Matt, I think?) working as an account manager and has an emotional relationship with her mom. Her man of honor was also Matt (this gotta be her favorite name! ), and it was my first time witnessing the man of honor helping the bride with her wedding dress. They had a Kogi taco truck for dinner then ice cream sandwich for dessert; it was so fun! We walked around the block and inside of the venue at The York Manor in Highland Park to make a few portraits with my amazing help Brett. Their day I remembered and witnessed was complete with so many moments of euphoria and celebration of their amazing love.